It is time to log our monthly progress for WIPocalypse hosted by Measi. This is such a fun and low stress SAL and you can find everyone else's post up here. One day I plan in being in the first row of the link-up but clearly not this month! Which designer’s projects do you absolutely love, but are too intimidated to try? This would have to be Chatelaine's and Goldwork designs. For me the biggest deterrent against a Chatelaine or similar silk-heavy piece is the cost. I am concerned that I will not like the piece enough to justify the much higher cost that silks and beads bring to the piece. I also do not like the idea of not being able to wash the final piece. At this point in my life my stitching place is wherever I am, which means pets are around, the furniture is far from pristine etc and not being able to wash a piece would not work well for me. If I was going to get into silks and goldwork I would want to have a designated stitching spot that the cat couldn't come into. Now onto the stitching. This month I was able to focus on my HAED which was really exciting. As I finished up the Kingfisher I was itching to get back into this and to finish up the page, and I did! Last time I had just finished the first flower and now I have finished one more, a bell shaped flower and started the one below it. This is the last page in the row which will be a huge step and it is a partial page so it should be faster. I am going to continue working on the Dryad this month and hope to get a decent dent in the 5th page. I have also picked out and purchased my next project to replace the Kingfisher. It is another bird piece! 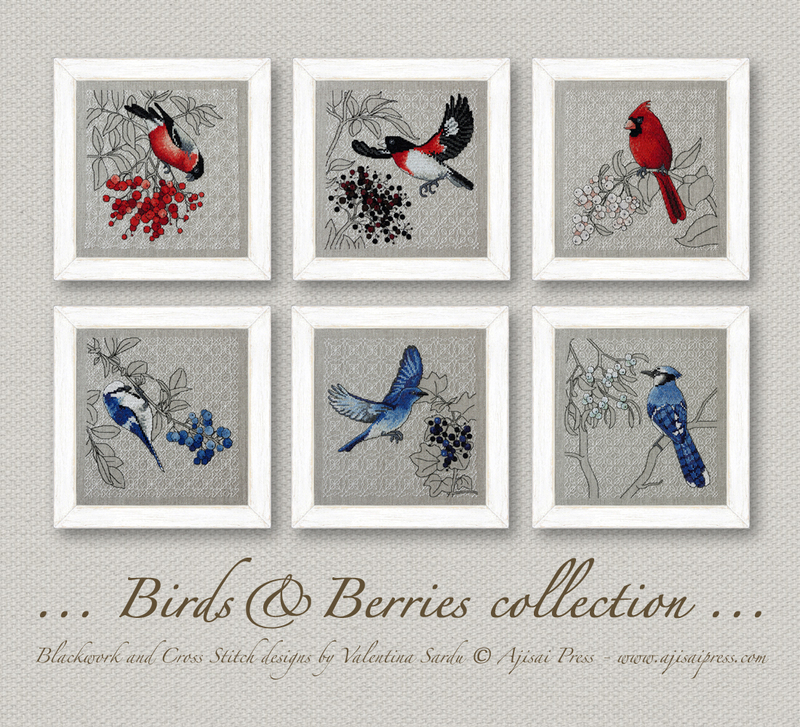 Actually, I do more than a normal amount of bird stitching considering I wouldn't say they are my favorite animal. This is a piece by Ajisai Designs (currently the site is down for maintenance) and is a mix of blackwork and cross stitch. They also did the ladybug piece that is fairly popular that was in the Just Cross Stitch magazine (I think) and that Mii is working on. I am planning on putting three on a piece of fabric and writing the names of the birds and plants under each one. I might do a few changes to make them all Canadian birds and my environmental scientist sister is researching which are found here and which aren't (or are introduced and non-native). These designs are quite small (100x100) and I am excited to really get going. I am planning on doing the cross stitching first and then filling in the blackwork but if anyone has any advice please let me know. 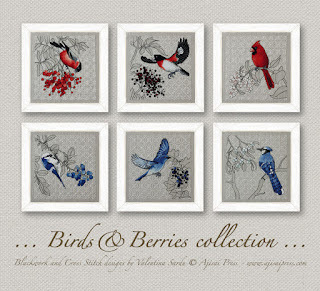 I adore the birds and berries collection, especially the blue ones. I never heard of Ajisai Designs before, but I will keep an eye out for when the website is live again. Thanks for visiting and for your nice comments. The goldwork pieces always look so beautiful. Even the ones done one hundred years ago. Those birds are lovely. I would do the cross stitch first and the blackwork after. If you make a counting error in the blackwork it doesn't matter because it just fits around the bird. Chatelaine do some freebies which can be stitched with just DMC if you want to give them a try! Great tip about the blackwork, will definitely do that. I will look into the Chatelaine charts and try them out, I have never done a repeating chart so it would be interesting to give it a try.